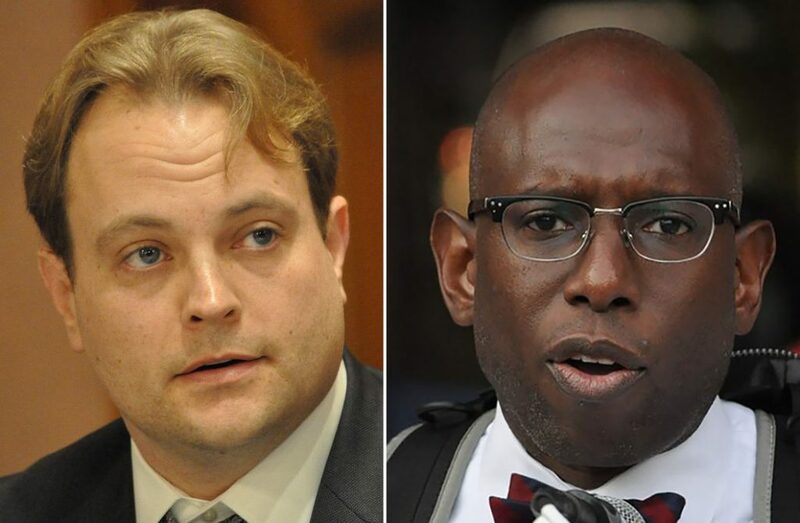 Common Council member Doug Stern (D-At Large), left; former Norwalk Branch NAACP President Darnell Crosland, right. The election is Nov. 6. A Democratic primary is Tuesday. NORWALK, Conn. – Norwalk and Wilton Democrats have the opportunity Tuesday to choose their candidate for Judge of Probate. Attorney Darnell Crosland is challenging Attorney Doug Stern, who won the endorsement at the Democratic caucus this spring. The winner of the contest will square off against Republican Attorney Larry Cafero in the fall election. Stern is a Common Council member who served on the Zoning Commission before winning election last fall. Crosland, former Norwalk Branch NAACP president, ran for Judge of Probate four years ago against Republican incumbent Judge Tony DePanfilis. Crosland took 43 percent of the Norwalk vote and 30 percent of the Wilton vote, for a combined 40.4 percent of the entire district. Stern has also been active in the Norwalk NAACP. Cafero is former District 142 State Representative, serving 11 2-year terms and retiring in 2014 after serving as Minority Leader for eight years. He was on the Norwalk Board of Education from 1987 to 1993, according to his website. NancyOnNorwalk emailed questions Friday to both Stern and Crosland. Stern replied with an essay; Crosland answered the questions one by one. Why are you running for Probate Judge? “The reason I decided to run for the position of Judge of Probate is because of my desire to serve the Norwalk Community. Over the years I have worked closely with the community, and while I respect City Council I always knew that aside from purely community based organizations like the homeless shelter and the NAACP, if I decided to serve in an official governmental capacity I wanted it to be in an area that was as much substance as it was form. As a seasoned lawyer, I knew immediately that I would be able to draw from my knowledge and experience in serving the people of Norwalk and Wilton as the Judge of Probate. If elected, what life experiences will you draw on in serving the public? “Once elected I will draw from my life experiences from my growing up in the Bronx and working with the Bronx Legal Aid in serving the poor while in high school, and from my experiences as a Juvenile and Adult Probation Officer in serving families. In addition, having served on Sen. Blumenthal’s panel on opioid addiction, and on the Norwalk Methadone clinic board, I know first hand how this crisis has effected so many families throughout the country, and I will bring my experiences to bear on appointing guardians for children left without parents due to this evil opioid crisis. Serving families is what I have done for decades and I will draw on those experiences as Judge of Probate. If elected, what, if any, changes or innovations would you make? How will voters be better off with you as Probate Judge? “Voters will be better off with me as Judge of Probate over my two opponents for all the reasons I stated above, namely because I have a great record of trying cases before the state and federal courts, both in Connecticut and New York, neither of my opponents can compare on that level, in addition to my legal skills, I have proven to be community minded, and I have worked with families as a juvenile and adult probation officer, experiences I can draw from, experiences neither of my opponents have. “As to my opponent outside the primary, I know Norwalk and Wilton voters can’t afford to pay a pension to him for the rest of his natural life for three (3) years of work. The law says that the Judge of Probate MUST retire at 70 years old. That would mean that Cafero could only serve a half of a term. Even if he served one four (4) year term at best, the voters will be paying him another pension on top of the one he already receives from the state having retired from the state legislature. This is just something the voters can’t afford, a conspiracy we the community will not be apart of. “With me as the choice, there is a money back guarantee, and I will not be presenting a smash and grab of the pension plan scenario. If I don’t make good on my promises, I can simply be voted out and not be paid for the rest of my life. With my opponent we don’t have that option. “As far as my primary opponent, he hasn’t even proven to the voters that he can finish what he started. His term in the common council isn’t even over and he is walking away. We need to vote for proven leadership, for winners not quitters. Cafero’s Facebook page says he was born on Jan. 8, 1958, making him 60 years old. Crosland emailed his answers to the questions late Sunday; Cafero was not available for comment. “The role of Probate Judge is a serious undertaking, and the happiness and well-being of the citizens of Norwalk and Wilton must be the utmost priority of whomever sits in that chair. There is no room for pageantry in the probate court. There is no room for ego in the probate court. There is no room for antics or self-serving promotion. Probate Judge is not like other political positions. The job is too important. “It would be the honor of my life to serve my community as Judge of Probate. And I promise to conduct myself in this role with integrity, with empathy and with compassion. “I have a diversity of life experiences that I feel will make me a well-rounded judge of probate that can empathize with all of the citizens of Norwalk and Wilton, from all backgrounds and walks of life. I grew up an ordinary kid from the area. I did well in school, participated in sports, and school activities. I worked for Stew Leonards in the produce section stacking corn outside and sorting fruits and vegetables inside. I then lived for four years in Nashville Tennessee as the first person from my high school and my family to attend Vanderbilt University. Attending college in the South helped me appreciate hard work and good manners, but it also exposed a need to never let manners prevent honest and straightforward conversations about deeply important issues like race, gender, religion and poverty. I always strive to be willing to discuss any subject in a respectful, thoughtful and direct way with anyone who wants to speak with me. From there I moved to Manhattan where, at the time, I thought a career in finance was what I wanted. I worked for Citigroup/Smith Barney, became Series 7 and 63 registered but, despite learning a lot, the job wasn’t for me. I realized that for me, personally, my life needed to be more engaged with people and the human condition around me. I needed to have a job that was geared towards helping people in need and making my community work better. It was there that I made my decision to go to law school. I headed South again, attending Tulane University’s School of law in New Orleans during a post-hurricane Katrina era. From the moment I arrived two things were evident, one, as a community we are all in this together and everyone has a responsibility to roll up their sleeves and pitch in for a city to survive, and, two, race and poverty chart the path of too many lives in this world and in order for the American dream to be truly available to all we are all going to need to fight, and we are all going to need to work. “After law school I knew what I needed to do. I decided to practice law on my own focusing on criminal defense work, and along the way get deeply involved in my community through local government, non-profits, and political organizations. Over the last years I am proud to have represented hundreds of underprivileged clients in Norwalk under very challenging and trying circumstances. Much of the volume of my clients come through Norwalk’s Public Defender referral service and are people who would not otherwise be able to afford counsel. Drug addiction, poverty, mental illness and family issues are often all present by the time I help my clients navigate the State’s criminal justice system. Over the years I have developed a temperament and a directness that has helped me serve the needs of those who truly need it, and provide stern legal advice while being sensitive to the many emotions at play. It is a true privilege to be able to help people during the most significant and stressful moments of their lives and has been personally rewarding in ways difficult to describe. “I also became involved in my community through work with the Family and Children’s Agency (the oldest non-profit in Norwalk). I began volunteering at their after-school program and their homeless shelter, and was eventually tasked with creating a Junior Board of Advisors, a platform that helps young professionals in this city get involved with the Agency’s many lofty goals. From there I was invited to join the Agency’s Board of Directors and have been proudly serving for over five years. During this time I also became involved in the good work of the Norwalk Branch of the NAACP where I was made an officer and legal redress chairman. Following these experiences I approached City Hall and was nominated and confirmed to serve on the City’s Zoning Commission. This position was time-consuming and challenging, and I loved every moment of it. This experience gave me a real sense of the City from a geographical and topographical perspective and it was a pleasure working with such dedicated professionals. From there I decided to run for office and was elected to the City’s Common Council At-Large. I have seen the city through a new lens in this capacity and have worked with my colleagues from many different life experiences and backgrounds to make good decisions on behalf of the people. These decisions are not without argument, controversy, or compromise, but I have learned from every member that I serve with and feel that we do not always come together and make perfect decisions, but we always do our best to make the right ones. “I am deeply committed to serving my community. I would love to help the citizens of Norwalk and Wilton in this new way and promise to serve this position with honor. Go to the State website here to see where your polling place is, or use the City website’s Registrars’ page. A background as a criminal attorney dealing with individuals running afoul of the law on serious issues would seem an unlikely preparation for Probate Judge dealing primarily with elderly folks and estates. Our current Probate Judge has a long reputation as kindly and considerate “publi servant”. That service ought serve as a role model for a successor. The key operative words here ought to be “compassionate” and “caring”. I’m voting for Howard Stern. Probate needs an insightful and intelligent person with a great sense of humor for those tough times. True or false: Larry Cafero is 67 years old? Is he 60? The voter file has the same birthdate as the Facebook page Nancy consulted…making Larry Cafero 60, not 67.